Town Hall Symphony Hall are looking for a composer / musician / educator to take on the role of Key Stage Three Jazz Electives Composer at Town Hall & Symphony Hall in Birmingham for the 2019 project. ‘Jazz Electives’ is a joint project between the Jazzlines and Learning & Participation teams at Town Hall Symphony Hall. Jazzlines is Town Hall & Symphony Hall’s dynamic strand of concert programming and inspirational education work, from jazz producers Tony Dudley-Evans and Mary Wakelam Sloan, whilst the Learning & Participation team connects with over 15,000 people from across Birmingham each year through a variety of projects and events. Both programmes particularly focus on our local neighbourhood of Ladywood, to provide musical opportunities in an area where 53% of children live in poverty. 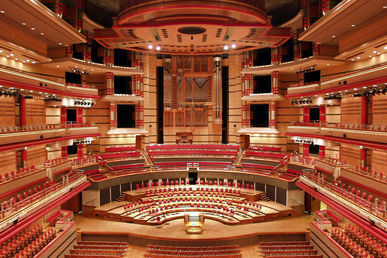 Town Hall Symphony Hall, in collaboration with Services for Education Music Service, will be hosting a schools’ concert, Generation Ladywood Showcase, on Friday 28 June 2019 in Symphony Hall. The concert is exclusively for Primary and Secondary school performers in the locality of Ladywood in Birmingham. The showcase has taken place annually for the past seven years and now includes the premiere of two new jazz electives pieces – one written by a composer for a large 300 strong Key Stage Two primary ensemble and one co-composed with a composer / musician / educator with a group of approximately 60 Key Stage Three secondary pupils. We are now looking to fill the role of the Key Stage Three Jazz Electives Composer role. Previous Key Stage Three Jazz Electives composers have included Kieran McLeod, Chris Mapp and Sid Peacock. For more details about the commission and role, please find attached a commission profile. If you would like to take up this opportunity please complete the attached application form and send it back to Jazzlines@thsh.co.uk by Monday 18th March 2019. A selection panel will assess all applications and the successful Jazz Electives Composer will then be announced following this selection process.